In December last year I began the carving work on the Scout Memorial which will be installed in the National Memorial Arboretum in Staffordshire next week. 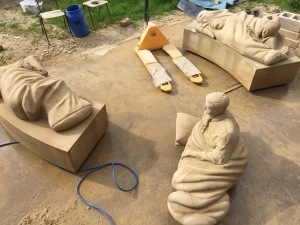 The sculpture will sit on a green granite, 8 metre diameter base and consists of 7 large stone sculptures carved to replicate a Scout campfire scenario. The memorial contains carved Scouts in sleeping bags and other objects that you would find on a typical Scout camp. The project started over 2 years ago when Scouts all over the UK were invited to submit ideas for the memorial. I was able to interpret these and develop them into an overall concept. Next week will see the conclusion of all of the hard work. The groundworks and paving are almost complete and the sculptures will be transported from my workshop to the National Memorial Arboretum in the coming days. The Memorial will be dedicated on Sunday the 5th of June. Although seats for the dedication are ticket only, there will be a live stream to a giant screen elsewhere on the site if you wanted to watch the ceremony and then view the sculpture afterwards. Details of the National Memorial Arboretum can be found on their website at thenma.org.uk The image shows 3 of the pieces being washed down outside my workshop.